A rising darkness. A magic portal. A desperate quest. A strange, dark place haunts Danny Stone’s dreams. A place that reveals glimpses of his mother, years after she mysteriously disappeared. She seems lost in a grim place, swallowed by darkness, searching for a way out. But where is she? Danny’s chance for answers comes when he and his friends discover the secret that their parents have been hiding: an ancient portal to a fragmented cluster of lands, forged by swords and shrouded in magic. 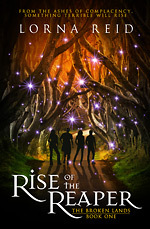 Taking matters into their own hands, Danny and his friends plunge through the portal to search for her, but their quest takes a terrifying twist when they learn of a coming evil that threatens not just those they love, but the very lands themselves. Their journey becomes a desperate race to change fate that will carry them into the arms of the rising darkness. But will they be in time? Can Jay Taylor’s life get any worse? 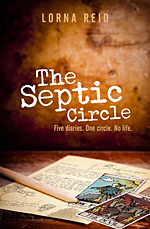 When he accidentally signs up for Cravenly’s only psychic circle, the sarcastic sceptic is in for a shock. After all, how many (allegedly) haunted toasters, possessed worry dolls, disastrous ghost hunting TV shows, and ego-ridden celebrity psychics can one man cope with? Jay’s patience may already be stretched to breaking point, but the ego ridden, so-called psychic star Fenwick Arcana could just push him over the edge. And he hasn’t even had his morning dose of Frosties. Having taken the nervous wreck who started the whole circle mess, Freddy, under his wing, and with gossip-monger Lysander and irrepressible believer, Marnie, to cope with, the circle’s most reluctant member is about to have his sanity severely tested. When a magical accident shatters Danny’s world nothing will ever be the same. Only the Darklands, forbidden and sealed, hold the key to saving him, but time is running perilously short. When they get separated from their shadowy guide, Danny and Katrina must fight through the sinister underworld of the Darklands together, each facing their own dark awakenings while evil closes in. Meanwhile, Poppy and Russell have their own struggles, as a reckless decision leads to disaster. They are forced on a terrifying journey, beset by shadows, and pursued by death. A face from their past offers the only flicker of hope that they have, but will it be enough and how far can they trust? With the friends divided, each will walk their own dark paths… but what and who will they find, and will Danny’s race against time end in grief? 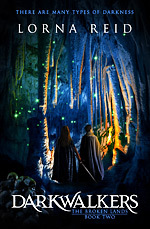 Darkwalkers is the second book in the epic fantasy adventure series The Broken Lands.